Swanky fusion cuisine in Santa Fe. : Geronimo's ambience and cuisine can be tough to pin down. The décor brings together old and new; rustic antler chandeliers hang from the ceilings and fires blaze in the corners of the eighteenth-century adobe building, yet the walls are adorned with oversize Asian calligraphy art and modern abstract paintings. Food-wise, generous entrées span continents, ranging from delicate green miso sea bass to hearty grilled elk tenderloin atop mashed potatoes, sugar snap peas and bacon. 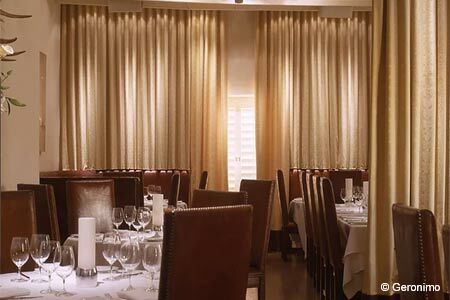 The extensive wine list offers global selections, while the conventional desserts feature cakes and cream pies. The Santa Fe community mourns the loss of Eric DiStefano, who presided over the kitchen at Geronimo for more than a decade. He passed away in February 2016.